With both the kids and my husband in bed for the night, I found myself once again trying to clean up our house. Its like a battle that can’t be won, but we keep trying to fight. (Like the movie 300, only with 299 less hot guys.) It is so frustrating to spend all of my free time trying to clean when I know it’ll look just as bad in a matter of days, if not hours! So tonight as I was staring at the mess trying to summon some deep, lost, motivation to get it done, I decided on a whim to stick everything on our living room floor into a pie chart of sorts. There are a few reasons why this is completely awesome. It makes me feel a bit better to visually see how much of this mess is a direct result of the 2 cute kids we get to call our own. The whole process entertained me immensely. Now I feel like I don’t have to clean it up so Shaun can see my awesome math skills! And really, when you look at it like this, it’s really not that bad. It’s pretty easy to clean it all up if the kids aren’t around to drag it all back out. Someday I’m sure I’ll miss having all of their tiny clothes and toys all over the house. Of course, I’ll be glad when they are big enough to pick them all up themselves. In fact, I think this could be a fun way to get everyone involved in cleaning up. 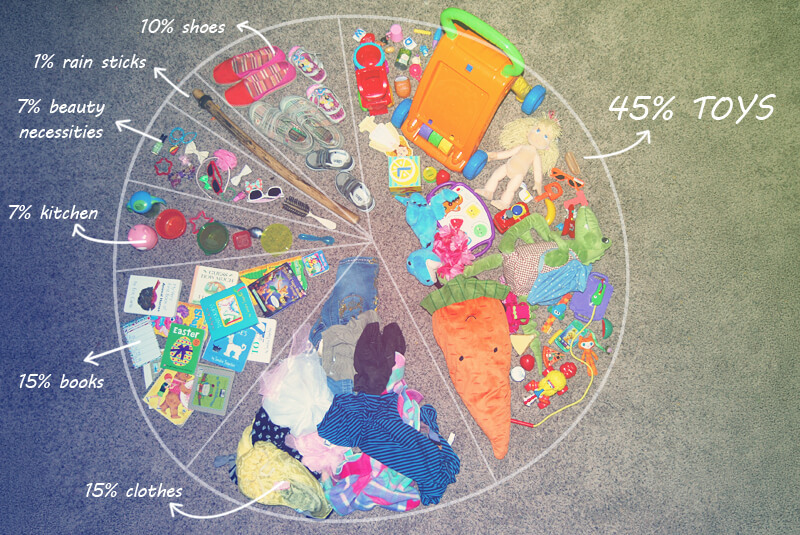 We could arrange the pie chart into sections according to who the mess belongs to, and then each person could clean up their section. We could even turn it into some sort of game, where whoever has the smallest section wins. Anything to make cleaning up more fun, right? I love this idea! You simultaneously made me laugh out loud, and say… "I wish that *I* had thought of that!"